Described by London’s Classic FM Magazine as a “sensationally gifted” musician of “stunning artistry”, Rustem Hayroudinoff has performed to great critical acclaim in Japan, the USA, Canada, his native Russia and Europe. In the UK he has appeared at major concert venues including the Barbican, Cadogan Hall, Wigmore Hall, Southbank Centre’s Queen Elizabeth Hall and Leeds Town Hall. More recently he performed Beethoven’s ‘Emperor’ Concerto with the Czech Philharmonic Orchestra under the baton of Marin Alsop, Rachmaninoff’s Concerto No. 3 with the Czech National Symphony Orchestra, Chopin’s Concerto No. 2 with the London Philharmonic, as well as appearing with the Soloists of the London Philharmonic in their Chamber Contrasts series in London and Munich and giving recitals at the American Shakespeare Center and St John’s Smith Square. The engagements in 2015-16 include Rachmaninoff’s Concerto No. 1 with the Bochum Symphony Orchestra in Germany, Tchaikovsky’s Concert Fantasia at the Teatro Colon in Buenos Aires and in Tokyo with the NHK Symphony Orchestra under the baton of Vladimir Ashkenazy as well as recitals in Europe and North America. His CD of the complete Rachmaninoff Preludes was selected by Classic FM magazine as part of it’s ‘Essential Rachmaninoff Collection’ alongside the recordings of Arthur Rubinstein and André Previn, and the recording of the complete Études-Tableaux by Rachmaninoff was hailed as a ‘benchmark recording’ and selected as Instrumental Choice of the Month by BBC Music magazine, as well as being nominated for the Best Instrumental CD of the Year award. It was also selected as the finest existing version of these pieces by BBC Radio 3’s ‘Building a Library’. 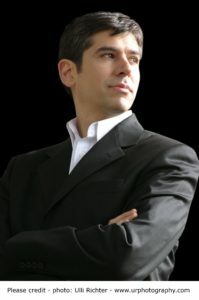 Among the orchestras Rustem Hayroudinoff has performed with are the Tokyo Symphony, Osaka Century, Czech Philharmonic, Czech National Symphony, BBC Philharmonic, London Philharmonic and Bournemouth Symphony orchestras. Hayroudinoff’s performances have been broadcast on most major classical radio stations around the world. He has also appeared in the documentary ‘The Unknown Shostakovich’ alongside Vladimir Ashkenazy, Valery Gergiev and Maxim Shostakovich. Rustem Hayroudinoff studied with Lev Naumov at the Moscow Conservatory and with Christopher Elton at the Royal Academy of Music, where he is now a Professor of Piano.